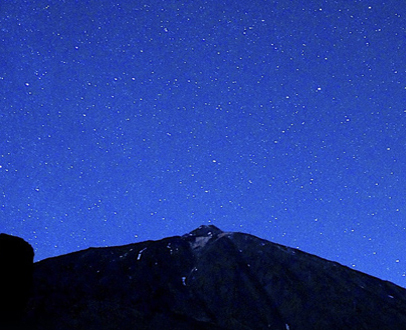 Teide By Night ®: "The Excursion" Official Website - Book now! Enjoy this sunset and stargazing experience in the craggy landscapes of the Mount Teide National Park. Crowned by the volcanic peak of Mount Teide, this natural wilderness takes on ethereal quality as the setting sun glazes its ridges and rocks in soft pinks, reds and purples. 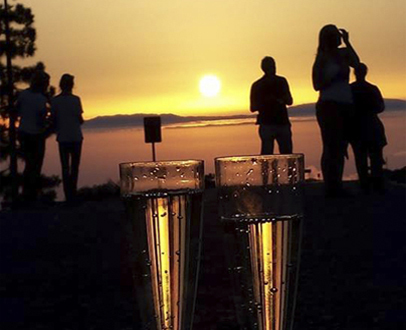 You´ll be whisked to a height of 7,000ft with photo stops along the way, to toast the sunset with a glass of Cava. A magical evening! Come with us for an unforgettable evening of spectacular sunsets and stargazing in the landscapes of the Teide National Park. "A highly recommended excursion. From the minute we were picked up outside our hotel, and throughout the tour, Jack was a welcoming and knowledgeable guide with a great sense of humour. We tried our first ever Barraquito coffee (delicious) at a nice cafeteria in Vilaflor, then headed up to Teide National park with lovely views the whole way. Drinking Cava and watching the sun set close to an active volcano was a first and amazing experience. Marcos was very attentive with topping up glasses and taking pictures. The dinner afterwards was very nice. Overall a fantastic evening, thank you Jack and Marcos!" "Fantastic guide Fernando made the whole experience great especially with his comedy, the tour was very interesting with regular stops so you didn't feel cramped, watching the sunset with drinks and blankets was a nice touch and the restaurant food was perfect followed by a night of stargazing. The whole tour was fantastic, very relaxed and at a steady pace thanks to our driver marco. Thank you very much Marco and Fernando!" 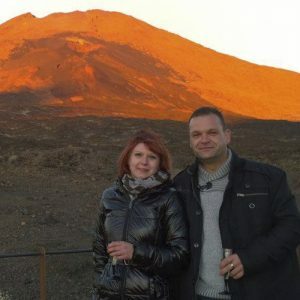 "Without doubt the best excursion we have ever had on Tenerife: interesting, informative, fun, great food and drink, good company, the best guide and driver ever (Fernando and Marco) and a view of the stars and Milky Way that I have never seen before - including 5 shooting stars. Fernando's laser-pointer-assisted explanation of the night sky was fantastic. I'd do it all again tomorrow." In our F.A.Q. you have a lot of information about our experience. You can also send us a message that we will answer in less than 24H (Working Days).